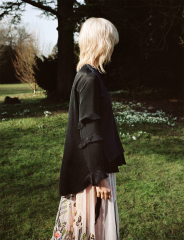 For spring 2017, Zara offers a modern boho-inspired collection with lots of easy breezy and casual lightweight pieces that will make you forget all about the cold winter days. Everything is focused on floral printed, flowy pieces, balanced by harder faux leather accents in outerwear and accessories. Check out our #ZaraWoman shoppable lookbook for a next-level wardrobe.